Regina Helcher Yost is currently in her 17th season as Second Flute of the Charleston Symphony Orchestra and 20th season as Assistant Principal Flute/Piccolo of the Colorado Music Festival in Boulder, Colorado. She also serves as the Adjunct Professor of Flute at Charleston Southern University and core flutist for Chamber Music Charleston. Mrs. Yost received her Bachelor of Music degree in Flute Performance from the Cincinnati College Conservatory of Music, was an Associate Instructor of Flute while pursuing a Master of Music degree at Indiana University, and was a flutist in the National Orchestra of New York (a national training orchestral that studied with world famous musicians and conductors and performed a six concerts in Carnegie Recital Hall). 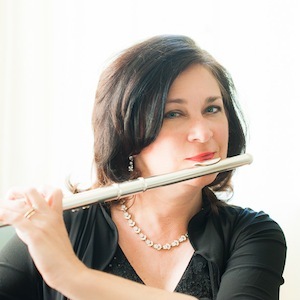 Previously, Mrs. Yost was the Associate Principal Flute/Piccolo of the Honolulu Symphony (1987-95), Second Flute/Piccolo of the Knoxville Symphony (1995-97), and Acting Second Flute of the St. Louis Symphony (1999-2000). In 2000, she soloed with the St. Louis Symphony in Brandenburg #4 in Powell Symphony Hall which received a standing ovation and rave reviews. In that same year, Mrs. Yost was also chosen to play in the Minnesota Orchestra on their NYC/European tour, playing in Carnegie Hall and the finest halls in Europe, including the Musikverein and the Philharmonie. In 2010, Mrs. Yost was one of two flutists selected to perform in the International Pacific Music Festival 20th Anniversary Alumni Orchestra in Sapporo, Japan conducted by Maestro Christoph Eschenbach. In 2006, Mrs. Yost performed with the Atlanta Chamber Players on their 20th Anniversary European tour, performing in Burgundy and Paris France, Lausaune, Switzerland and Rome, Italy. Mrs. Yost has performed in many music festivals including Tanglewood, Pacific Music Festival (Japan), GRAZ (Austria), Sarasota Music Festival, Chautauqua, among many others. In May 2013, Mrs. Yost performed with Chamber Music Charleston in Carnegie Recital Hall (Weill). Mrs. Yost served as Chairman of the National Flute Association’s Piccolo Committee from 1998-2000. She currently is serving as a member of this committee. She has also served as a judge several times for the National Flute Association’s National Piccolo Artist Competition._As an advocate of new music for the piccolo, Mrs. Yost has commissioned many new works by composers Mike Mower, Jan Bach, Jindrich Feld, Stanley Friedman, Robert Cronin, Martin Amlin, Christopher Caliendo and Gary Schocker. She is currently working on a project to record all of the new piccolo compositions.